Phenol is a unique alcohol due to having a benzene ring and associated resonance. 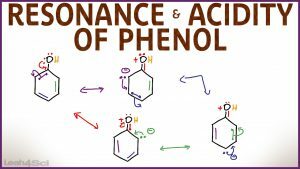 This video walks you through phenol resonance structures to help you understand how resonance impacts its acidity. Examples include comparing phenol to acetic acid as well as the impact of substituents on the ring like nitrophenol. This is Video 4 in the Alcohol Reactions Video Series. Click HERE for the entire series. Alcohol Practice Quiz and Cheat Sheet Coming soon!